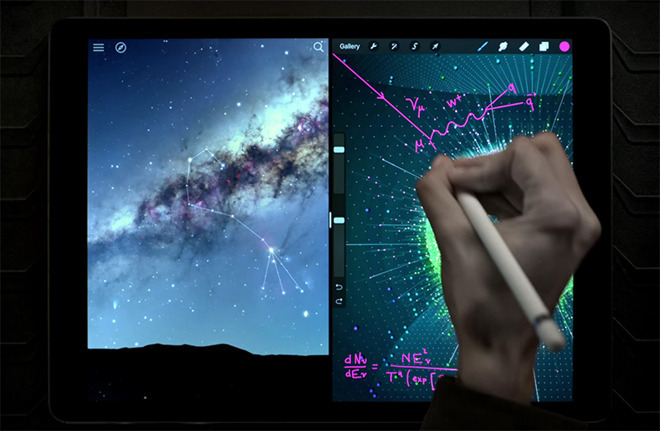 Ahead of Apple's iPad Pro preorder kickoff on Wednesday, the company released a new TV spot highlighting the advantages of a gigantic touchscreen, including split screen views in iOS 9 and Apple Pencil markup support. Emphasizing the immense screen real estate offered by iPad Pro's 12.9-inch display, Apple spends more than half of its 30-second "A Great Big Universe" commercial on awe inspiring images of the cosmos. The camera slowly pans out to reveal iPad Pro running Sky Guide —albeit with greatly enhanced imagery —to survey the night sky. Aside from the huge screen, a major hardware draw for many, Apple also shows off split screen multitasking and a sample of note taking support using the $99 Apple Pencil accessory. The features are shown in quick succession before the tagline "Introducing the biggest iPad ever" splashes across the screen. According to The Verge, the ad is set to debut during Monday Night Football later tonight. Apple announced earlier today that it will start accepting iPad Pro preorders on Wednesday, with shipments due to arrive later this week. Third-party resellers pegged availability for Friday, though Apple has not yet revealed an official release date.